Prestwick Airport is served by the usual multi national car rental companies and Hertz and Avis both have car rental desks located in the arrivals hall. These are however expensive options and significant savings can be made by booking your rental car with us in advance of your trip. Prestwick Airport is located in Ayrshire on the west coast of Scotland just to the north of Ayr and to the south of Troon. 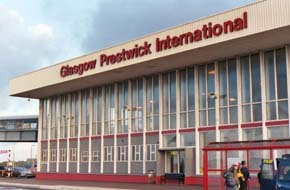 Once Scotland’s major transatlantic gateway, Prestwick’s fortunes declined during the 1990’s however, it now caters for over 2 million passengers per year and is a popular arrival point for visitors from Italy, France, Belgium, Sweden, Germany, Spain, Norway, Ireland and England using the budget airline Ryan Air. Prestwick Airport is approximately 34 miles from central Glasgow with an estimated travel time of 45 minutes to one hour by car via the M77/A77. It is 70 to 80 miles from central Edinburgh depending on the route you take and you would need to allow 1 hour 45 minutes to 2 hours 15 minutes travel time by car. There are two direct routes to Edinburgh, one via Glasgow and the M8 is slightly longer and is considerably busier but depending on the time of day can be the quicker route. The second, via the A70, goes across country and is quieter but is likely to be slower. Prestwick Airport is the only airport in Scotland served by its own railway station. The station is accessed directly from the airport terminal and the journey to and from Glasgow Central Station operated by ScotRail takes just over 40 minutes and operates half-hourly Monday to Saturday and hourly on Sundays. The last train leaves the airport at 23:07. The airport is served by Stagecoach Western express coach services which run to and from Glasgow Buchanan Street Bus Station via Kilmarnock. Buses run every hour (increasing to every 30 minutes at peak times). The service operates 7 days a week with a journey time of 50 minutes. Short and long-term car parking is available on the airport site. Long-term car parking can be pre-booked by telephoning 0870 0134503. You must pre-book 24 hours in advance. Travellers with special needs should contact the Prestwick Airport Information Centre on 0871 223 0700 to pre-arrange assistance or check what facilities are available. Prestwick is a small airport, however, it is well equipped with shops, restaurants, a bureau de change and a children’s TV area. The check-in is located at the front of the airport concourse with domestic arrivals and all departure lounges located towards the rear.